At first, being tasked with the feat to operate a three ton machine was a bit nerve-inducing. Luckily, these guys are with you every step of the way and they equip you with the confidence you need to fully participate in all of the fun activities. Now I've gotta be super honest with you, I definitely didn't expect to have as much fun as I ended up having. Playing around in a gigantic dirt pit and learning how to use heavy machinery does seem like a lot of fun, don't get me wrong. But the feeling I got when I was getting the hang of it and being able to dig up some dirt really did make me feel like a kid again! And I know it sounds completely cheesy, but it's so true! I couldn't stop myself from laughing or smiling as I was digging up my pile of dirt and building up my tire castle. They call it a tire "pyramid," but I felt like such a queen while I was running my Excavator so flawlessly that it was obviously dubbed a castle. Now that I know how to dig up so much dirt and have fun doing it, I'm ready to build someone a pool. The instructors here are all about making sure you have a good time. If you forget which button or lever does what, the instructor helps you over the headset so you can keep up with the activities. There were definitely times when I forgot how to do something or which way was left, and our instructor, Junior, was patient with us and kept us laughing the whole time. This is basically an experience I'm never going to forget. Spinning around in the cab of the Excavator brought me back to spinning around in the teacups at Disneyland, but it's even more fun because it's less nauseating than the teacups. I'm also such a huge fan of city skylines, and for as long as I live here, I'll never get tired of gorgeous city views. 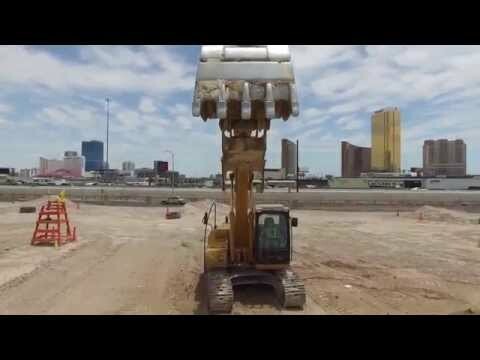 The dig site is perfectly adjacent to the Las Vegas strip, which means the view is pretty incredible.